As early as today, Cebu Events Blog will congratulate the Aboitiz Race to Reduce 2011 WINNERS not just in the Race but also in their Challenge towards Earth's Sustainability. One more sleep. 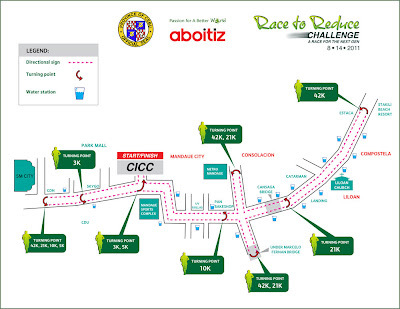 And its time for the Bigger Aboitiz Race to Reduce 2011 on August 14 in Cebu City which features a 42K full marathon. The other categories are 3K, 5K, 10K and 21K. The race will start off at the Cebu International Convention Center (CICC), North Reclamation Area, with assembly time at 3 a.m. and the starting gun firing off at 4 a.m. Check on the Map below for the aboitiz Race to Reduce 2011 Route. Now on its second year, the run organized by Aboitiz Equity Ventures, Inc. (AEV) in partnership with the Cebu Provincial Government will be one of the highlights of the One Cebu Expo, the Capitol’s month-long celebration of the Province’s 442nd Founding Anniversary on August 6. 1. A relaxing foot massage, a hearty breakfast, and a photo opportunity in front of the Race to Reduce photo wall await runners crossing the finish line. 2. 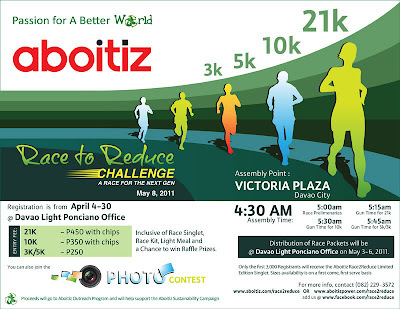 Aboitiz Race to Reduce Photo contest of interesting images captured during the race as it unfolds. Cash prizes are at stake and winning photos will be published in both print and online media. 3. Timing chips will be used by runners in the 10K, 21K and 42K divisions to provide accurate, instantaneous results. For those running in the 5K, they will have to use timing chips if they want to compete for the top awards in that category. Sebastian Lacson, AEV Chief Reputation Officer said “It takes all of us to leave a better planet. 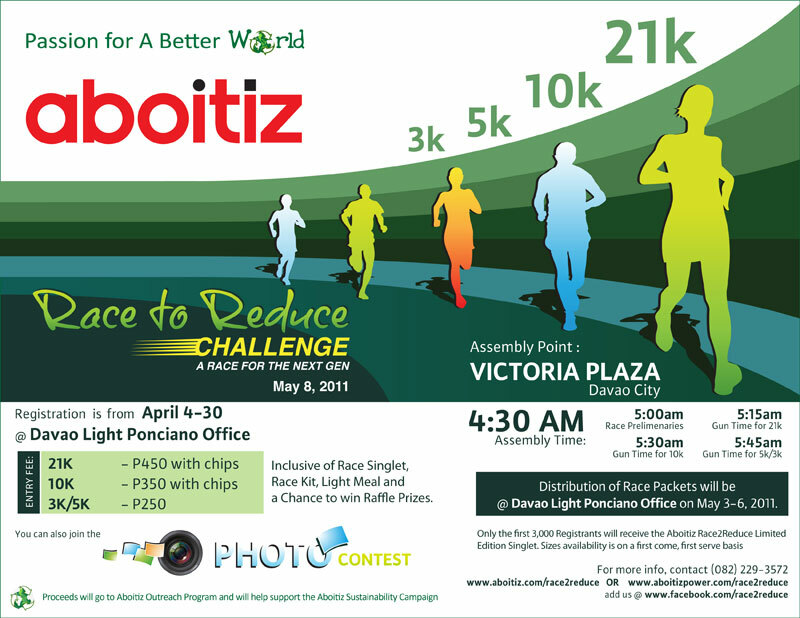 Let’s start now” The Race to Reduce Challenge is part of the Aboitiz Group’s information campaign on its sustainability efforts. Aboitiz Equity Ventures companies Group-wide have an ongoing contest, also called Race to Reduce Challenge, where they compete for the lowest consumption of power, water, and paper in the workplace. Congrats Aboitiz Race to Reduce 2011 Winners posted at Cebu Events Blog. 0 comments: on "Aboitiz Race to Reduce 2011 Route Map on August 14 2011"